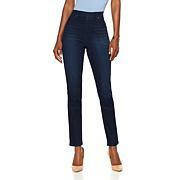 These are really great, comfortable jeans. Definitely dont size up, if anything size down, they have a lot of stretch. 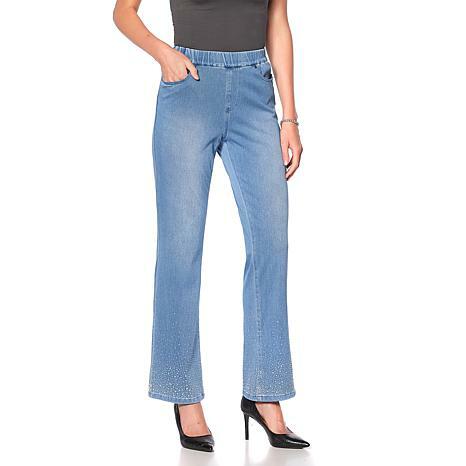 These jeans were a perfect fit and extremely comfortable but the flare leg is not for me. I prefer boot leg, straight leg or skinny. So I did return them but as I said, they were made very well and very comfortable. Very comfortable. Runs a little large and a little long (I'm 5'5"). Overall, love the look because it's not too over the top as far as the embellishment. FABULOUS!!! SO COMFORTABLE AND SO CHIC! LOVED IT! GOING BACK FOR MORE,BRING MORE COLORS! SIZE DOWN, I AM USUALLY 1X BUT THE X-LARGE WILL FIT TOO! LOVED THE MATCHING JACKET WITH THOSE FANTASTIC BUTTONS! GOOD JOB JOAN!!! LOVE ALL YOUR ELEGANT PIECES! I didn't believe that they would fit nor be comfortable. Was I ever wrong. Not only do they fit, I wonder if I should size down!!!! The comfort is like wearing pj bottoms. Do these come in colors? If not, why not?